Good morning eP friends! 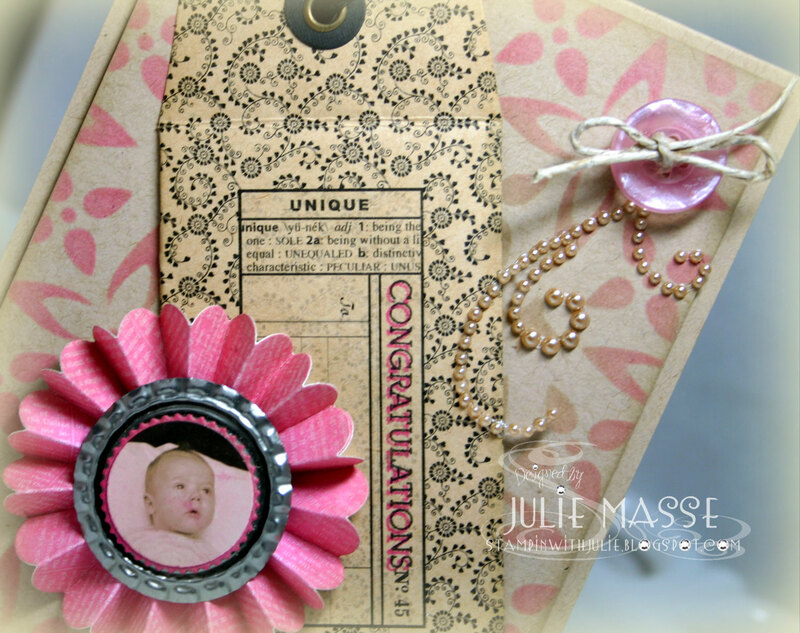 It's my turn (Julie) to post some fresh inspiration for you and let me just say how much FUN I had with this card! It's sooooo not my usual style but it's really fun to step outside your comfy zone sometimes right?! I had a bit of fun using a beautiful stencil from Crafter's Workshop, this one is Mini Flower Piercing. I used the stencil on a piece of kraft cardstock and used 2 different Distress inks. I started with Old Paper in the center and then gradually changed to Picked Raspberry (from the Summer Seasonal set). Once I had that I played around with some fun Envelope Tags from Graphic 45. Since they are so vintage and, well . . .eclectic (LOL!) I went with a vintage-y theme. During a recent clean-out I came across a bag of vintage photographs bought from an antique store several years ago. There were several pictures of this adorable baby (isn't it sad that someone lost their family's photos?!) so I die cut the face, added a wash of pink with the Picked Raspberry ink and layered it on to a flattened bottle cap and rosette made with paper from Authentique's Lively 6x6 pad. 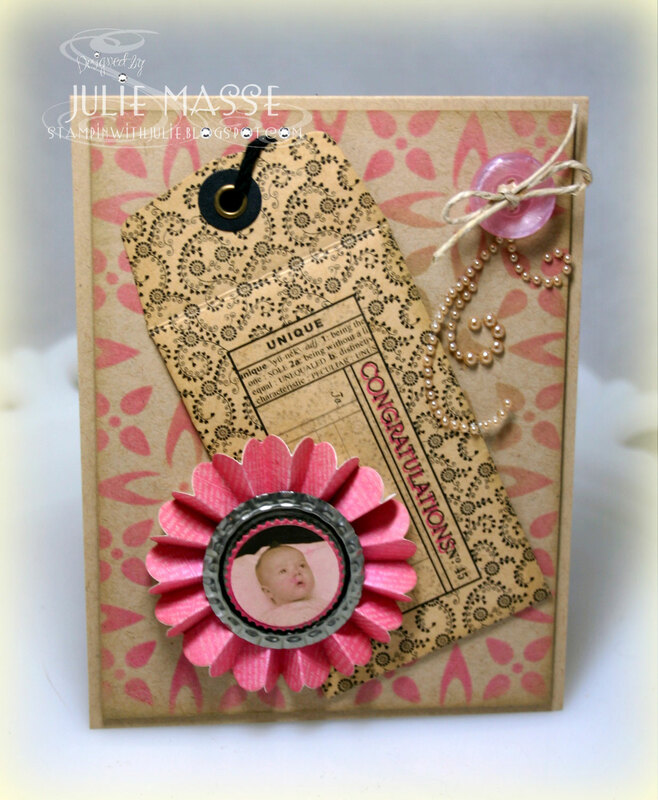 What a fun baby card for an antique-loving friend! Thanks for checking out eP today, I've linked up the products used below. Have a great day! Wow, Julie this is awesome! 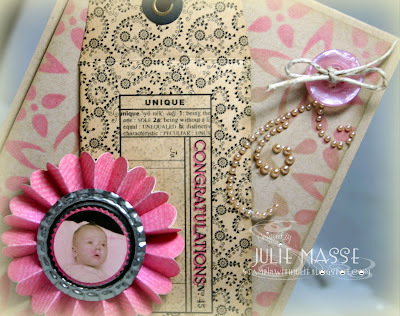 I adore the stenciled background in the pink...such a perfect combo with the paper and buttons. Beautiful! What a great card, Julie! Love the vintage look, and showing off the photo on the rosette is a fabulous idea!